One of the things I enjoy most about participating with my fellow food bloggers in the weekly Friday posts of the Gourmet Live 50 WomenGame-Changers is discovering a new chef. 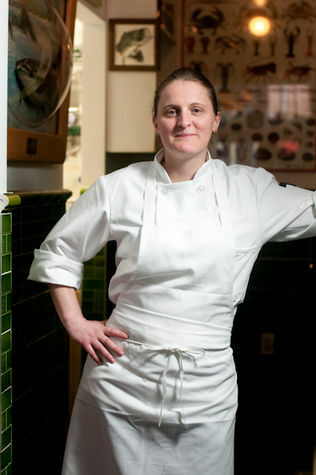 This week’s selection, April Bloomfield, was new to me. A native of Birmingham, England, she is the owner and chef of the Spotted Pig, a gastropub in New York’s West Village. In 2005, she received a surprise Michelin star in New York’s first Michelin Guide. Before landing in New York, Bloomfield worked in the kitchens of some well-known restaurants, including two I’m dying to try: River Café in London and Chez Panisse in Berkeley, California. The reviews I read of her food at the Spotted Pig call it a mix of English and Italian. The recipes I read sounded more French to me. Perhaps that proves more than ever that food is the one thing that crosses all cultural borders. I came across this recipe for chicken with a vinegar sauce the day after I saw Laura Calder make a similar dish on her Cooking Channel show, French Food at Home. I thought it sounded easy and intriguing: How could that much vinegar make a good sauce? Even if you don't make the sauce, this recipe is a great way to roast chicken. But without the sauce it would be a bit bland. Try it for yourself and let me know what you think. Preheat the oven to 450 degrees. In a large, deep skillet, heat the oil. Season the chicken with salt and pepper, add to the skillet and cook over moderately high heat until browned. Add 1 tablespoon of the butter to the skillet and swirl to coat the chicken. Turn the chicken skin side up and add the garlic and bay leaf. April definitely loves her vinegar don't you think? You picked a wonderful recipe to showcase. Next time I roast a chicken I many have to try this. Thanks for sharing it with us. Wasn't this chicken good? I made the same this week and was pleasantly surprised by how the sauce actually tasted mellower than expected and went perfectly with the chicken. You were very brave for trying this dish with all that vinegar in it. Sometimes you just have to have faith. Your chicken looks delicious! I would really enjoy this recipe! Nice post! I was very surprised how good this dish turned out. I think I'll try it again but with a different vinegar to see how it alters the taste. I'm so glad you tried it before tossing it. Sometimes we just need to keep the faith when trying new dishes, especially when from such accomplished chefs! I've seen recipes for chicken in vinegar in the past; with your post I think I'm now ready to try one.